Rheumatism Affects more than just the Joints! Rheumatism affects more than just the joints: the heart and circulatory system are also at risk!The knowledge gradually sinks in, even for patients: inflammatory rheumatic diseases like rheumatoid arthritis (RA) not only damage the joints, but also the blood vessels. 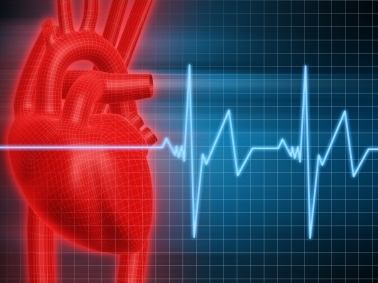 Patients with rheumatism thus have an increased risk of suffering a heart attack or stroke. According to numerous studies and investigations, smoking is also particularly damaging. The reason for this is that tobacco contents favour the formation of inflammation-promoting ACPAs, anti-citrullinated protein antibodies. Also, smoking decreases the supply of blood to joint cartilage. “Arthritis patients who smoke not only suffer more pain, they also require higher doses of medication and generally have more problems with their joints,” states Prof. Jürgen Braun. RA patients have a higher risk of suffering a heart attack or stroke. In people with a genetic predisposition toward rheumatoid arthritis, smoking can accelerate onset of the disease. Cessation of smoking not only causes the disease to have milder symptoms and medications to be more effective; it also decreases the risk of accompanying disease of the heart and kidneys. This risk is significantly elevated in patients with rheumatic disease and rises further for smokers. In my article, There Is a Connection between Rheumatoid Arthritis (RA) and Smoking – What Are the Reasons?, posted on ORGENTEC’s Autoimmunity Blog on 21/05/2010, I discussed this relationship between cigarette smoking and RA. In that post you will find numerical data, links, and references on the subject of smoking and rheumatism. Early diagnosis and treatment on time is crucial! However, there is also some good news: If RA is diagnosed early and treated on time, the heart and blood vessels are also protected by the treatment. Because certain drugs used for treating RA inhibit inflammation throughout the body (DMARDs, disease-modifiying antirheumatic drugs), they not only relieve damage and pain in the joints, they also hinder threatening cardiovascular diseases. If rheumatoid arthritis is diagnosed early and treated on time, the heart and blood vessels are also protected by the treatment. One long-serving “classic” for the treatment of RA is the drug methotrexate, a DMARD that can slow the progression of RA over the long term. Prof. Jürgen Braun relates more concrete figures on this subject: Use of methotrexate reduces the risk of heart attack by 18 percent and the risk of stroke by 11 percent. “An early start to treatment is of critical importance in rheumatic diseases – not only for the joints, but also for the effects of rheumatism on the heart and circulation,” according to the Medical Director of the Ruhr Centre for Rheumatism (Rheumazentrum Ruhrgebiet). Early treatment is naturally dependent on early diagnosis of the disease. Recently, the scientific guidelines for the early diagnosis were published in the new 2010 ACR / EULAR Criteria for the Classification of Rheumatoid Arthritis (see our posts of 06/09/2010: The 2010 ACR / EULAR Rheumatoid Arthritis Classification Criteria in Brief and 24/08/2010: New Classification Criteria for Rheumatoid Arthritis). The paradigm shift in rheumatoid arthritis is very clearly complete! Although the 2010 ACR / EULAR Criteria are criteria for classification rather than diagnosis of RA, the paradigm shift regarding the handling of rheumatoid arthritis is – at least from the scientific and teaching points of view – very clearly complete. Today, remission of rheumatoid arthritis is possible and should be the primary goal of RA treatment (see our articles: Recommendations on the Management of Rheumatoid Arthritis (RA) with DMARDs, posted on 18/06/2010, and 10 Facts about Rheumatoid Arthritis: The Clinical Understanding of the Disease, posted 03/05/2010). This “new knowledge” must now be applied and implemented in practice by all of those involved: physicians, patients and their family members, and not least by state- and privately-run health care systems and insurance providers. Author of this article: Tobias Stolzenberg. Aletaha D, Neogi T, Silman AJ, Funovits J, Felson DT, Bingham CO 3rd, Birnbaum NS, Burmester GR, Bykerk VP, Cohen MD, Combe B, Costenbader KH, Dougados M, Emery P, Ferraccioli G, Hazes JM, Hobbs K, Huizinga TW, Kavanaugh A, Kay J, Kvien TK, Laing T, Mease P, Ménard HA, Moreland LW, Naden RL, Pincus T, Smolen JS, Stanislawska-Biernat E, Symmons D, Tak PP, Upchurch KS, Vencovsky J, Wolfe F, Hawker G. The 2010 ACR-EULAR classification criteria for rheumatoid arthritis. Ann Rheum Dis. 2010 Sep;69(9):1580-8. Baka Z, Buzás E, Nagy G. Rheumatoid arthritis and smoking: putting the pieces together. Arthritis Res Ther. 2009; 11(4): 238. Review. – free article download! Smolen JS and Aletaha D. Developments in the clinical understanding of rheumatoid arthritis. Arthritis Res Ther. 2009; 11(1): 204. – doi: 10.1186/ar2535 – free article download! JS Smolen et al. EULAR recommendations for the management of rheumatoid arthritis with synthetic and biological disease-modifying antirheumatic drugs. Ann Rheum Dis 2010;69:964-975 – doi:10.1136/ard.2009.126532 – abstract! Sugiyama D, Nishimura K, Tamaki K, Tsuji G, Nakazawa T, Morinobu A, Kumagai S. Impact of smoking as a risk factor for developing rheumatoid arthritis: a meta-analysis of observational studies. Ann Rheum Dis. 2010 Jan;69(1):70-81. Review. – abstract! Westhoff G, Rau R, Zink A. Rheumatoid arthritis patients who smoke have a higher need for DMARDs and feel worse, but they do not have more joint damage than non-smokers of the same serological group. Rheumatology (Oxford). 2008 Jun;47(6):849-54. – free article download!